Urban Leadership Awards The Urban Leadership Awards (ULA) Program honours individuals, groups and organizations that have made significant contributions to improving the quality of life in Canada’s cities and urban regions. The awards program is also a fundraiser for the Institute in support of our internship program, dedicated to providing undergraduate scholars with practical work experience. 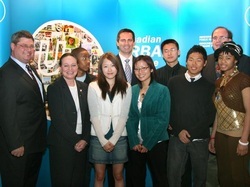 The awards are given Canada-wide by the Canadian Urban Institute. Mr. Lashbrook can be seen in the top right of the picture, along with his now retired former principal Ms. Karen Jackson second from the left, as well as with Premier Dalton McGinty in the top center.